I got this from my friend Naomi and I could not believe how soft this top actually was. 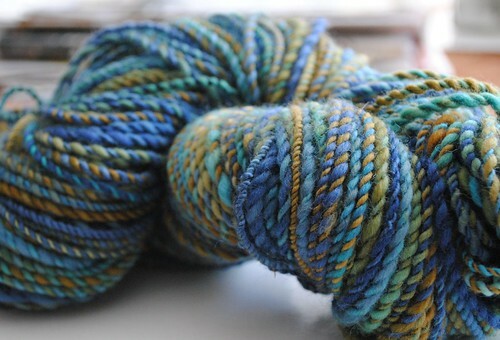 I will also have to say that the dye job and the preparation of this top allowed me to make this skein in one afternoon. Making yarn n a wheel is comfortable and it is fast once you get to know the fiber. Yep you heard it right the first few yards of your spinning is As I was spinning I realized that this was a very soft fiber, even though it looked very rough to the eye. The dye job that they did on this material was fantastic, there were no flaws in the way it looked or felt. kind of like a get to know you for me. All in all this Southern Cross Fibre is a place that I am going to check out real soon. This polwarth wool top allowed me to give this yarn some character, more than what it already possessed when it arrived as a top to my hands. So I will say that this is a great place to get some nice fiber if you are looking to spin. I was able to get 165 yards and I could have gotten more, but I am a real novice with the wheel. 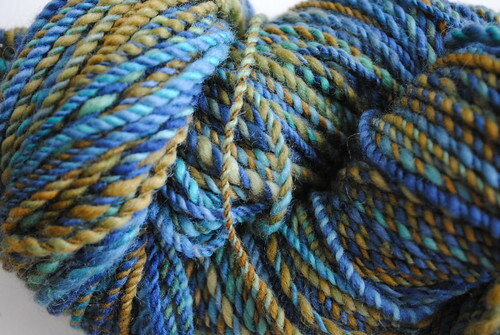 Believe it or not when I washed this yarn and was helping it set the twist, the yarn got softer , it is a piece of heaven. Thanks Naomi once more. To my surprise this fiber allowed me to a a Crafty guy and do my thing. I have some pictures that I will be uploading later on about the San Mateo County Fair and the Participation of the Men Who Crochet Chapter from the CGOA in it. Thanks for stopping by!